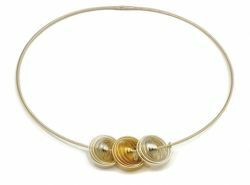 This elegant piece incorporates swirl(s) made from sterling silver only, in combination with swirl(s) made from fine gold and silver fused together. The fused swirls have a double-sided effect with either the silver or gold side seen. Option 1 is seen as the lower piece in the detailed image, while option 2 is the upper one. 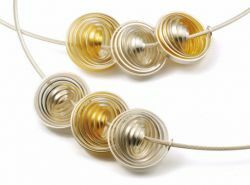 Please select your preferred option from menu, along with the cable necklace size. Delivery time please call to discuss if you have a specific date you would like the item for. Daniela will prioritise where ever possible to meet your requirements.